Sci-fi stories lend themselves well to graphic novel format mainly because it is much more fascinating (and challenging) to illustrate complicated machinery and futuristic world and beings, as opposed to describing them in great detail. A picture is truly worth a thousand words in this context. Being a big fan of the written word, I thoroughly enjoy reading the thousand words and letting my brain come up with the visuals, but sometimes it helps to see it all in pictures conjured up by a talented artist. 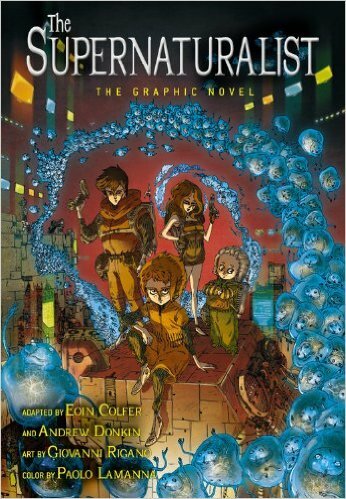 The novel was quite the regular sci-fi fantasy, and this graphic novel adaptation stays true to the original. Cosmo Hill is 'parentally disadvantaged'. Since there are no state funded orphanages, his particular shelter has resorted to fund-raising by allowing experiments on its inmates- the little orphan kids. Cosmo escapes with the help of some friends who happen to be similarly gifted as himself: they can see the Parasites that drain the human life force in Satellite City. Together, the group of kids take it upon themselves to protect Satellite City from the Parasites. One thing that can get annoying in graphic novels is the urge to have narration tell big chunks of the story rather than through characters and illustrations. A lot of exposition and filling in happens along the way, through wordy text boxes, which takes away from the graphic novel experience. The deep green palette and the style of illustrations align well with the grim dystopian story but it was not quite appealing to behold as most of the panels were dark and intense. More for the older kids, the graphic novel is an interesting presentation of the story. Here I am assuring you that if you want the best graphic design work and you do not have any real solution from where you can get the high-quality graphics work, and then this ilustra.co.uk/story/ will help you a lot for getting the best quality graphic work on the very reasonable price.